PokeGymCyrus’s Conspiracy is one of the most used cards in our format, being a key card in three of the most powerful decks in the format, DialgaChomp, LuxChomp and Sablelock. Today’s review will be of its twin, Cyrus’s Initiative. To start off, it has the usual benefits and disadvantages of being a Supporter (I don’t need to say what they are every time I review a Supporter, do I?). When you play Cyrus’s Initiative, the first thing it tells you to is flip 2 coins. This right away tells you that its effect will be based on the result of those flips (da! ), so how much this card helps you during the game will rely on luck. More experienced players aren’t usually a fan of having their cards at the sole digression of lady luck. However, if the card is good enough, it can still see play. For example, Uxie’s “Set Up” leaves a lot to luck, but since you could be drawing 5+ cards, the potential for getting something you need is quite high. In this case, when you play Cyrus’s Initiative, you flip 2 coins. If either of them is heads, you get to look at your opponent’s hand. OMG that is such an amazing effect, its gotta be an instant four of in every deck, right? No. Thankfully, we’re not done. For each heads you flipped, you get to choose a card from your opponent’s hand (while looking at it!) and put it to the bottom of your opponent’s deck. Now, this is obviously a Supporter that disrupts your opponent, and boy does it! Being able to snipe (using the term rather loosely) up to 2 cards from your opponent hand put them on the bottom of their deck is pretty powerful. 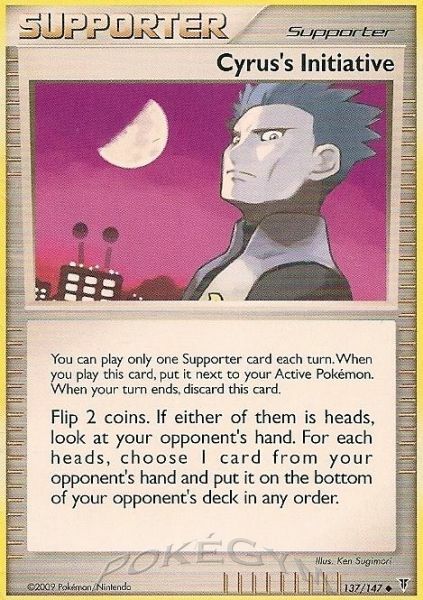 Getting rid of a Pokémon Collector, Cyrus’s Conspiracy, Call Energy or Uxie gives you a massive edge over your opponent. It’s also great mid- and late-game as well, allowing you to get rid of a key Double Colorless Energy, Uxie or Professor Oak’s New Theory is just too good. PokeGymThere is one thing that I don’t like about this card, however. Often times, you’ll need the Supporter slot to play a consistency card such as Bebe’s Search or your own Cyrus’s Conspiracy. 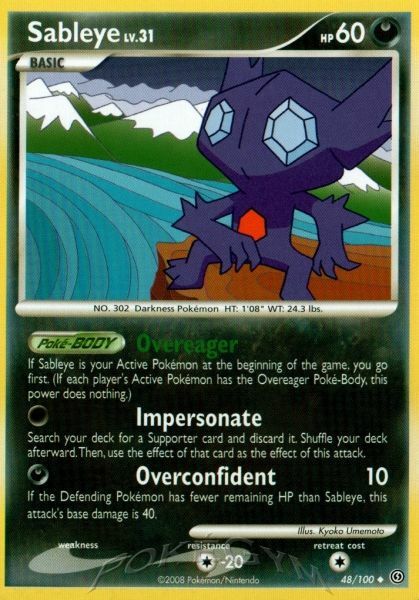 While this doesn’t work well late-game (although, it isn’t impossible to pull off), early-game you can use Sableye’s “Impersonate” to use it from your deck. Also, if you do the Smeargle thing (where you use a Collector in your hand or “Portrait” one from your opponent), you could be using three Supporters in a single turn (granted you go second), which is why many Sablelock and Gyarados players have switched over to this. My Recommendation: If you’re using Sablelock, it’s an obvious 1-2 copies in your deck (I prefer two, but some builds can get away with 1), but other disruption decks can benefit from playing a copy of it as well. Works pretty decent in VileGar too in addition to sablelock decks. I really like this card, I run 2/3 in Nidotank and Gyarados and can be great early door like you say for Impersonate because you already have Collector/communication in your hand. also the odds say you will get to put one card on the bottom and look at their hand so you assuming the rest of their hand isnt too great you can choose to use it again or not on the next turn. The great thing about this card is that if you play it early enough, just by dropping a single card from your opponent’s hand, you can entirely cripple their setup. That’s a part of what makes Sablelock so powerful.